It’s not uncommon for uninvited rodents to make their way into your home or business. If you were unfortunate enough to have had a rodent die in your home, you know will how pungent the odor is. Dead rodent odor is very easy to notice and hard to forget. In addition to the various diseases harbored by dead rodents, the odor alone is often enough to make a person sick. Getting the dead rodent odor out can provide your home with fresh, clean, healthy air to breathe. If you experience a foul-smelling dead rodent odor in your home, it’s crucial to take immediate action to rid odor and its source before it becomes a danger. Firstly, look for the dead rodent by following the odor and remove it. Also look for flies and wet spots on walls or ceiling that can lead you right to the spot. You may also see maggots migrating away from the dead rodent. When you find the dead rodent, pick it up carefully and dispose of it in a sealed plastic bag. Always wear gloves and a mask while handling the carcass and cleaning contaminated areas, as dead rodents are carriers of many of diseases. Clothing worn while handling a dead rodent should be discarded. Secondly, take action to remove the dead rodent odor immediately. If you were unfortunate enough not to find the dead rodent, don’t despair! Unfortunately, this happens if it’s hidden in a wall or vent for instance. It may take a little longer but you can still get the dead rodent odor out. At first glance, you might be tempted into using some of the home remedies suggested on the internet to rid odor because you think it will save you money. The common ones include using vinegar, lemon juice, vanilla, coffee, charcoal, baking soda, newspapers and even vodka! So, what’s a person to do? I would suggest using your household items for what they were designed to do best. After all, if they were such great odor removers, wouldn’t the manufacturers have already sold them as dead rodent deodorizers for more money? It’s important to remember that as time passes you will get used to the dead rodent odor. You might start thinking that home remedies are helping but the odor problem could still be lurking in your home and affect the health and wellbeing of your family without your knowledge. Why turn your home into a science project and start experimenting with home remedies when you can buy proven, tested, and guaranteed dead rodent odor removers that work. The good news is I’ve found a professional strength targeted odor remover made specially to get the odor out from dead rodents but costs even less than most home remedies. I recommend using SMELLEZE™ Reusable Dead Rodent Deodorizer Pouches to rid the decomposing dead rodent odor without covering-up with harmful fragrances. Simply place the pouch in areas with dead rodent odor or place inside your return air vents and smell the difference. This amazing odor removal product will even help rid odor if you were not able to find the dead rodent because it works continuously to filter the odor 24/7 no matter where the odor source is. The remarkable SMELLEZE™ Dead Rodent Deodorizer sells for only $12.99, and since it’s is reusable for over a year, the average cost is only about 3 cents/day! If safety is important to you, you will be happy to hear that this dead rodent odor removal product is totally safe, non-toxic, natural, odorless, and doesn’t contain any harmful chemicals. 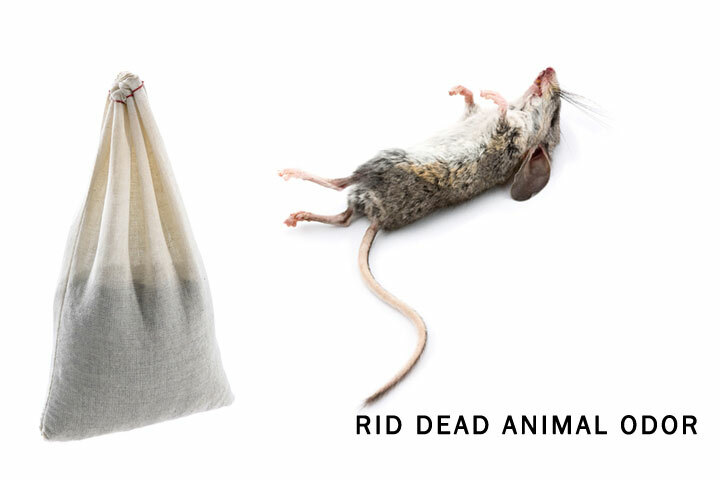 If you are environmentally conscious, you will be glad to learn that is an eco-friendly, reusable, and recyclable dead rodent deodorizer that doesn’t use any energy. Furthermore, this is an innovative 100% American odor removal product that is designed, engineered and manufactured in the USA. If all this sounds too good to be true, just look at the many unsolicited raving customer reviews for this odor remover that has a 20+ year proven track record. I bpought a used Leather Chair — it has an order of perfume or colone in it. Has zippers where the odor is. What do you suggest to take the cologne out of the leather. I would recommend sprinkling Smelleze® Natural General Purpose Smell Deodorizer Powder on your furniture to draw the chemicals and odor out before it’s released into the air.